Austrian authoress; born in Tobitschau, Moravia, Feb. 17, 1852. Her early education she received from her father, a physician. With her parents she removed successively to Holleschau, Vienna, and Budapest. She is well versed in French, Italian, Hungarian, Czech, and English, and obtained a diploma as teacher of languages. After teaching for a few years, she received (1874) from Ludwig II. of Bavaria a free scholarship at his theatrical school in Munich. Her studies were interrupted by her marriage to Prince Theodore Kolokotronis of Greece. Joining the Greek Catholic Church, she accompanied her husband to Athens, where both she and her husband were disowned by the latter's family. 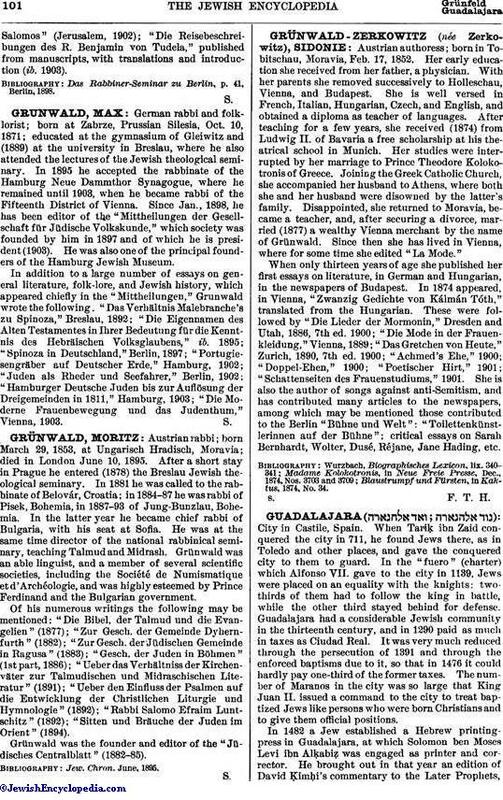 Disappointed, she returned to Moravia, became a teacher, and, after securing a divorce, married (1877) a wealthy Vienna merchant by the name of Grünwald. Since then she has lived in Vienna, where for some time she edited "La Mode." When only thirteen years of age she published her first essays on literature, in German and Hungarian, in the newspapers of Budapest. In 1874 appeared, in Vienna, "Zwanzig Gedichte von Kálmán Tóth," translated from the Hungarian. These were followed by "Die Lieder der Mormonin," Dresden and Utah, 1886, 7th ed. 1900; "Die Mode in der Frauenkleidung," Vienna, 1889; "Das Gretchen von Heute," Zurich, 1890, 7th ed. 1900; "Achmed's Ehe," 1900; "Doppel-Ehen," 1900; "Poetischer Hirt," 1901; "Schattenseiten des Frauenstudiums," 1901. She is also the author of songs against anti-Semitism, and has contributed many articles to the newspapers, among which may be mentioned those contributed to the Berlin "Bühne und Welt": "Toilettenkünstlerinnen auf der Bühne"; critical essays on Sarah Bernhardt, Wolter, Dusé, Réjane, Jane Hading, etc. Blaustrumpf und Fürsten, in Kaktus, 1874, No. 34.